International Configurations, Inc., established in 1977 is a leading supplier of the following European/International wiring devices that are in accordance with VDE, BSI, OVE, NEMKO, DEMKO, CEBEC, KEMA, UL, CSA and other International test/approvals agency standards. Applicable devices are CE marked and RoHS compliant. European Schuko CEE 7/7, CEE 7/16 power cords, cord sets, plugs, outlets, connectors, multiple outlet power strips. United Kingdom BS 1363A, BS 546A power cords, cord sets, plugs, outlets, connectors, multiple outlet power strips. Australian AS/NZS 3112 power cords, cord sets, plugs, outlets, connectors, multiple outlet power strips. IEC-60320, C5, C7, C13, C14, C19, C20 power cords, cord sets, plugs, outlets, connectors, power outlet strips. IEC-60309 power cords, cord sets, plugs, outlets, connectors in splash proof and watertight variations. Nema 5-15, 6-15, 5-20, 6-20, 15A-20A straight blade type power cords, cord sets, plugs, outlets, connectors. Nema L5-15, L6-15, L5-20, L6-20, L5-30, L6-30 Locking type power cords, cord sets, plugs, outlets, connectors. Hospital Grade 5-15, 6-15, 5-20, 6-20 15A-20A power cords, cord sets, plugs, outlets, connectors. 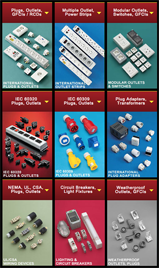 International/European plug adapters, circuit breakers, light fixtures, transformers, bulk cordage. Supply Cord Sets and Detachable Cord Sets for that specific Country / Standard. Products We Offer On Our Wiring Devices "Main Website"
Light Fixtures, 230 volt LED Download "Devices Catalog"
Located in Enfield, Ct. USA, International Configurations, Inc. maintains a large stock of the above components for immediate delivery. In addition, custom molded power cords or assembled cord sets of various special design and detachable cord sets can be supplied. Contact us for product application and technical assistance.